Maybe it was a passage that seemed to leap from the pages of Scripture. But perhaps it was a pastor or a trusted friend. Or it might have been a mother whose bedside “Now I lay me down to sleep…” made an eternal impact. For so many believers, prayer is not simply taught; it’s modeled by another. That’s how it was for Jamie Wilkerson. Her mother would faithfully kneel down and pray with young Jamie morning and night, instilling in her a passion for prayer which burns to this day. Like Jamie, Joe Arena sees prayer as one of the most vital practices of the Christian. 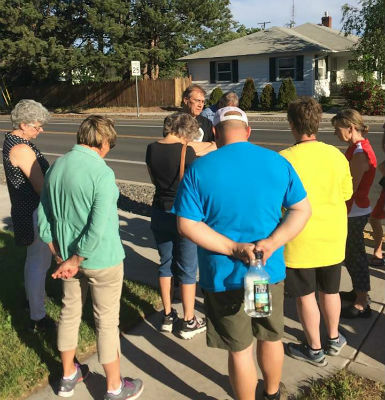 Involved in numerous prayer ministries inside and outside the church, Joe’s pursuit of God on bended knee isn’t unlike that of Pastor Dave Thompson and the Church of God in Redmond, Oregon. Their desire to intercede on behalf of church, community, nation, and world is nothing short of infectious. As the Church of God prepares for the 360 Revolution prayer and evangelism initiative this September, these three individuals offer some timely perspective on prayer. A little over a year ago, Jamie was asked to put together a team of prayer warriors to intercede regularly on behalf of Church of God Ministries staff and their families. Each of the members of the team serve other ministries, but when they come together, they focus exclusively on the needs of the “base camp.” Church of God Ministries staff couldn’t be more grateful. But to intercessors like Jamie, prayer isn’t a chore. 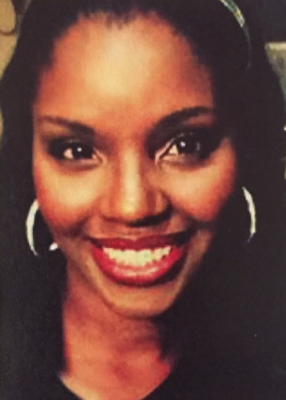 It’s second nature—an outflow of what she saw and heard as a child. Many in the Church of God remember the name Joe Arena from the Church of God Convention in Anderson. 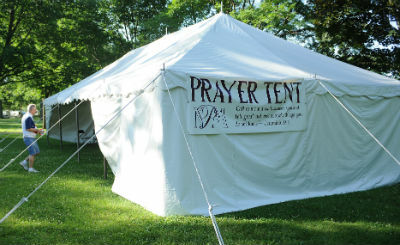 Year after year, Joe coordinated the prayer tent. Today he meets monthly at City Hall to pray with and for local leaders. On Wednesday mornings, he meets with a variety of churches at East Side Church of God to pray for revival. Then on Fridays at noon, he meets with Ryan Chapman of Church of God Ministries and other pastors to pray for Church of God higher education—sometimes walking the campus of Anderson University—and lifting up the Church of God movement. At his home church, South Meridian Church of God, he personally meets with Pastor Ed Hyatt for prayer each Sunday morning. And these are just a few of the ways God is using Joe Arena. Photo: Joe Arena enters the prayer tent in Anderson (file). Jamie, Joe, and Dave know how important prayer is to the individual believer, the church, and the world. They know it strengthens spiritually, allows the church to “hear from heaven,” opens up the door for blessing and healing, destroys the schemes of the devil, and breaks down walls. We all want that, but sometimes Christians don’t know where to start. Jamie offers some advice. Join the revolution—the 360 Revolution! Register and download free resources for the prayer and evangelism initiative of the Church of God (coming this September) at www.JesusIsTheSubject.org/360. This entry was posted in All Church of God, Church of God Ministries, Great Lakes, Northeast and tagged Dave Thompson, intercession, Jamie Wilkerson, Joe Arena, OR, Oregon, pray, prayer, Redmond, Redmond Church of God. Bookmark the permalink.